How many companies service your facility? Its not unusual to require several construction trades at one time. That means there are a lot of intertwining phone calls and different companies coming and going from your facility. Instead of deciding at which company to point the finger next, give Schiller a shot. We take out the frustration of pointing fingers when the outcome isn’t up to snuff. We can manage all of your entryway needs. On top of all of that, we can provide installation as well. Multiple calls to find a carpenter, electrician, access control technician, security contractor, or fire control inspector are eliminated with Schiller. We can be your one-stop-shop for your door systems. If there is ever an issue with our products, you have but one number to dial. Schiller takes the guessing game and the frustration away from your door system. With more than 40 years of commercial entryway experience, we can make recommendations on entryway placement, size, code adherence and functionality. Additionally, we can help you plan for access control. 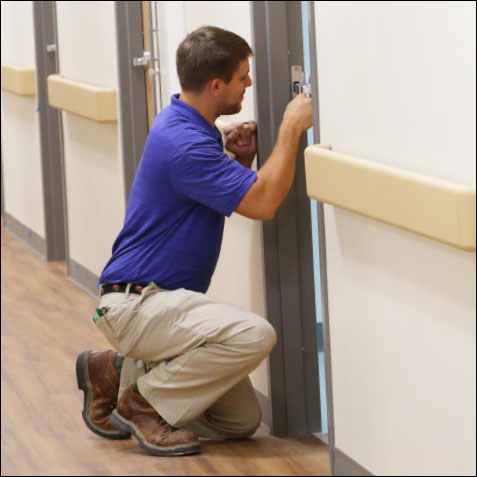 For more information or to schedule an appointment for a Door Doctor diagnosis of your building, reach out to us at our Louisville, Lexington or Clarksville office to speak with someone from our team. We are the Door Doctors because we know how to keep your building healthy.